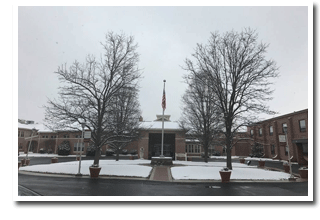 Although Punxsutawney Phil predicted an early spring on Groundhog Day, recent snowfalls seem to indicate that warm weather is still quite far away. With that in mind, our Green Committee has complied a few tips that can help you be more eco-conscious through the end of winter. Opting for firewood rather than turning on the thermostat in the winter months can save energy for many homeowners. But fireplaces and wood-burning stoves can emit large amounts of soot and carbon pollution into the air. Older model fireplaces and stoves can also harm the air quality in your home. Upgrading to a newer pellet or wood-burning stove is provides greater efficiency than traditional open-air models. Using clean-burning stoves such as a biomass- and bio-fuel burning stove is more efficient alternatives to wood burning. Clean-burning stoves give off fewer toxic emissions and use cleaner fuel, such as ethanol or bigas. Biofuels used for home heating come in the form of logs, wood chips, wood pellets or other recycled materials. Contemporary stoves typically burn cleaner and can reduce home heating costs. Walk around your home to check for leaky windows and doors. You may be surprised to learn that cold air is coming in. The potential energy savings from reducing drafts in a home may range from 5% to 30% per year, according to the Office of Energy Efficiency and Renewable Energy. Thankfully, in most instances, solutions are relatively easy and affordable. Homeowners can conserve heat and energy by weather-stripping and caulking leaks. I did this and realized that I needed stripping for my patio doors and had to ensure my screen door was properly secured to avoid a draft. Window treatments or curtains may improve your home’s energy efficiency by trapping heat in, but the U.S. Department of Energy also encourages homeowners to open curtains on south-facing windows during the day. Natural sunlight is a great way to heat your home for free. Another way to make winter a little greener is to avoid using toxic chemical de-icing salts and sand. Homeowners typically use salt and sand on icy sidewalks and roads to make them safer, but they aren’t the best for the environment. Before choosing a chemical de-icer, consider its impact on plant life, concrete, vehicles and animals. And although sand isn’t corrosive, it can clog storm drains and cause flooding in the spring. Even rock salt can cause environmental contamination and damage pavement. Greener alternatives include Magic Salt, which is rock salt treated with magnesium chloride and a sugar byproduct. It has earned the EPA Design for the Environment label, which recognizes that the product is considered to be safe for the environment. Magic Salt is 70 percent less corrosive than rock salt and works to 35 degrees below zero. Ice-Clear, another green option, is a liquid you spray on the pavement and is best used before snowfall. It is made of a corn extract so the sugar reacts with the pavement to form a bond that prevents ice from sticking. Ice-Clear is 100 percent organic and noncorrosive. Also, Ice Melt by Earth Friendly Products is both animal- and eco-friendly salt. When you buy vegetables and fruit out of season, not only are they being shipped longer distances, burning more fuel than usual to get to your grocer, but they also ripen during transport instead of being picked ripe. Season-appropriate produce requires less energy for transport, is less expensive and often tastes better. According to healthyeating.org, eating fresh fruits and vegetables provides the body with more nutrients, easier digestion and a boost to the immune system. Examples of produce in season from October through the winter months includes apples, pears, beets, pumpkins, cranberries, blackberries, cabbage, celery, broccoli, kale, Brussels sprouts, carrots, cauliflowers, potatoes, beans, winter squash, sprouts, leeks and spinach. I’m sure you can find something you love in this list! Have you considered buying organic clothing? Organic clothing may be good for the environment. Chemicals used in the process of making clothes can damage the environment through run-off water after heavy rains, which poisons lakes and rivers. According to the Organic Consumers Association, cotton growers around the world often use liberal amounts of insecticides, herbicides and synthetic fertilizers to grow the cotton. Seven of the top 15 pesticides used on U.S. cotton crops are potential or known carcinogens. Organic cotton apparel may also help reduce allergies and respiratory problems. So when you load up on warmer cotton clothes this season, consider choosing organic cotton. In the winter, wool, hemp or fleece are greener fabrics that will still keep you warm. Wool is a natural product, unlike many synthetic materials that won’t biodegrade. It is durable, which creates less waste since it will last longer. It’s no secret that winter is harsh on both humans and vehicles. If you know people who are taking the same route every day, consider carpooling to save on gas expenses and wear-and-tear on your car. Consider starting a driving rotation with three or four people to lighten your load. Even carpooling once or twice a week can save money and help the environment. If one person is driving, split the cost of gas between the other passengers. Not only are you and the others minimizing your carbon footprint, but you may feel safer and get a sense of security from having partners to ride with in the event of a weather-related problem. Driving in the winter can be stressful at times. On days when you don’t need to drive, you can relax, read or just take it easy during the commute for a change. 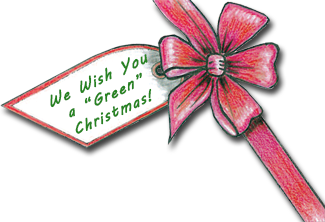 Whether you’re hosting Christmas Eve dinner, Christmas Day brunch or a holiday open house, our tips can help you make help make the season bright…and a little greener too! Simplify the day. Celebrate being with those you love. Don’t overdo the cooking – and savor whatever you make. Linger over dessert, play games, watch football or a favorite movie, take a walk. Revive special traditions from the past and create new ones you can turn to next Christmas and other holidays in the future. Use the good dishes and cloth napkins. Disposable dishes and plastic utensils create a ton of waste. If reusable won’t work, choose disposable plates, cups, napkins and utensils made from 100 percent post-consumer waste recycled paper, sugarcane and corn—they are compostable, too. Decorate with boughs and berries. Head out to your yard with a pair of shears and find tree branches, bush stems loaded with berries, flowers whose seed heads have dried on the stem, and flowering grasses to fill tall vases or holiday baskets. Let there be light. Illuminate your table with candles of varying heights and widths. Serve locally grown food. Even in colder, northern climates, farmers markets are still selling locally grown greens, potatoes, apples, pears, spices, breads, and cheeses. Offer organic beverages. From apple cider to wine and beer, you have plenty of organic drinks to offer your family and friends. Eat all the food you make. Send guests home with leftovers in glass jars rather than wrapped in plastic or aluminum foil. Freeze leftovers in easily re-heatable portions. Use reuseables. Serve your meal on cloth tablecloths and napkins, accompanied by “real” silverware and plates. Worried about cleaning up after a large crowd? Let everyone pitch in – that’s half the fun! Simmer cinnamon. Roasting vegetables and baking pies should infuse your home with delicious holiday aromas. For even more fragrant smells, simmer a few sticks of cinnamon and a few cloves of allspice on the stove. Dab a few drops of pine oil or other favorite fragrance on stones or pinecones that are part of your centerpiece. Prepare less food. Everybody feels compelled to make a huge meal and prepare numerous courses. This year, if you’re serving turkey, choose a smaller bird and skip some of the less-popular dishes to reduce food waste. Turn down the heat. If all your holiday cooking doesn’t heat up your house, your guests will. Turn your thermostat down 3-5 degrees – no one will notice the difference. Recycle and compost. Keep a bin handy for glass, plastic and paper trash you can recycle rather than toss. Make soup from vegetable peelings, leftover meat and bones. Picked-over vegetables can be composted, though remaining meat and bones will need to be thrown away.